Scroll down for news about Carroll County Government, Carroll County Schools, and Carroll County events calendar. Learn more - Get Tickets for the Maryland Wine Festival. Carroll County Event News, What's happening in Carroll MD. The Carroll County Times, Westminster MD, is one of the primary news providers in Carroll County. In addition to the Carroll County Times, some other Carroll County news reports originate from the Baltimore Sun, The Westminster Eagle, The Eldersburg Eagle, The Advocate of Westminster and Finksburg, The Advocate of Eldersburg and Sykesville, Mt. Airy Messenger, Northern News, WTTR radio in Westminster MD, and Community Media Center and Carroll County local television programming. The Carroll County Business/Employment Resource Center is hosting the 2019 Spring Job Fair on Thursday, May 2, from 10 a.m. to 1 p.m., @ BERC, 224 N. Center Street, in Westminster, MD. No pre-registration is required. The BERC Spring Job Fair is an event that enables community members and job seekers to meet and speak with representatives from area businesses that are looking for qualified employees. Job seekers can complete applications and distribute their resume to participating businesses. For more information, please contact Scott Singleton, 410-386-2820 or visit the BERC website at www.carrollworks.com. Attend a Fire Carnival to support local Fire Companies in Carroll County MD. 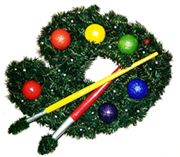 Each year more than 150 theme wreaths are displayed through this week-long silent auction that is one of the Carroll County Arts Council’s most significant fundraising events. Wreaths and Holiday Art may be donated by businesses, civic / social organizations, schools, offices, families or individuals. There is no registration fee. Stop by participating downtown businesses for your sweet treat, live music & more! Don’t miss the 22nd annual Stop, Swap and Save, the East Coast’s Largest Indoor Bicycle Swap and Consumer Expo. If you’ve never made it to the SWAP before, don’t miss out in 2019! International Bull Riders (IBR) was established in 2001. Since its inception, the IBR has sanctioned hundreds of events. Each year IBR pays over $100,000 in prize money and awards. The Penguin Random House Book Fair kicks off with a Family Movie Night! Two showings: 4:30pm and 7:00pm. GRAMMY nominee Guy Davis is considered to be “America’s greatest link to the blues right now” (Windsor Star). His recent albums have been nominated for a Grammy, as well as for Best Acoustic Artist. Thank you for visiting the Carroll County News page featuring news about Carroll County schools, upcoming events taking place in the Carroll County community, and local news for Westminster, Eldersburg, Sykesville, Taneytown, Hampstead, Manchester, Mount Airy, New Windsor, Union Bridge, and Finksburg. Need to know what's happening in Carroll County Maryland, visit www.carrolldeals.com and click on News. Helping Job Seekers find Employment Opportunities in Carroll County Maryland. See new Jobs available now!